Switch to the Manage tab on the Ribbon, and then click the Record button on the Action Recorder panel. After entering the above sequence, click the Stop button on the Manage tab > Action Recorder panel. 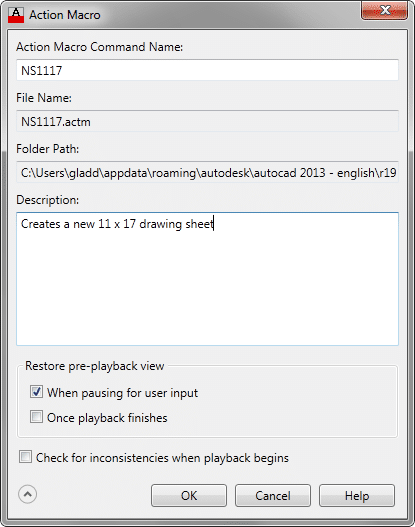 A new Action Macro dialog will open after stopping the Action Macro recorder. Here you will give your macro a name; the name you choose will double as a new command inside AutoCAD. For this reason, I like to choose something like NS1117for New Sheet 11 x 17. After saving your Action Macro test it by entering its name at the command line. In the example above, I named my macro NS1117, so I’ll enter that at the command line. In addition to the creation of a new Layout tab, a Playback Complete dialog will also open to confirm the macro was correctly executed. 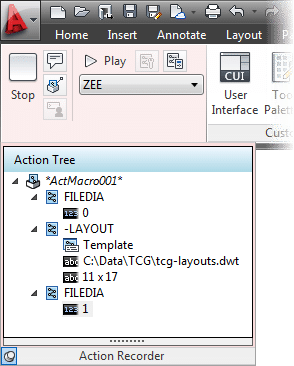 Hi this was really useful…actually am about to create cad template with specific size,title block and layer setup …is this possible..could you please help to find out solution. can you edit existing macros? If you need save the macro with a longer, more descriptive name you can edit your acad.pgp file to make a shortcut for it. Or for the mouse people, I suppose you could make a button to click too. Another trick is to edit the file location where the macros are saved, and point it to a shared network location. 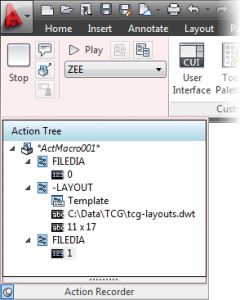 Set it the same for others in the office, then anyone can access a macro that someone else has recorded.